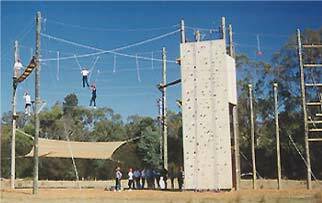 A ropes course is a challenging outdoor team adventure learing experience which usually consists of high and/or low elements. These low elements take place on the ground or only a few feet above the ground. High elements are above a ground an usually constructed at summer camp. I had the opportunity to particapte in a ropes course when I went through Hancock Leadership class in Findlay, Ohio, USA. Our leadership class went to the Campfire Camp Glenn summer camp located outside of Tiffin, Ohio, USA. We had several low element elements, and then we all had to climb over the WALL. Our task was to get our team over the wall with out using any ropes , ladders, or other tools. The wall was large and tall, but we got everbody over the other side. This was a great teambuilding experince, as we problem solve and took action. Take your team to this new Ohio ropes course. It is six stories high. The country’s largest indoor waterpark resort, located in Sandusky, Ohio, is expanding again with its new Kalahari Zip Line Course. Designed with an African village theme and set above the resort’s outdoor waterpark, the experience will feature six-story towers that launch guests; a towering ropes course; and a rock climbing wall. This brand-new adventure area is part of Kalahari Resort’s expanding team-building activities for meetings and conventions, but will be available to all guests. Target opening date is late spring 2010.